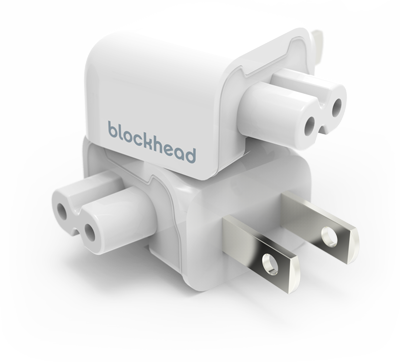 Blockhead snaps on to your existing Apple charger, allowing it to sit flat against the wall. Now it can fit in more places than ever. Blockhead snaps on to your existing Apple charger allowing it to sit flat against the wall. Now it can fit in more places than ever. Sculpted to fit your charger, Blockhead provides a strong mechanical grip and safety-certified electrical connection. Sculpted to fit your charger, Blockhead provides a strong mechanical grip and UL approved electrical connection. Sometimes a small change can have big benefits. Turning your charger sideways lets it fit just about everywhere. Blockhead directs your cord downward along the wall at a more natural angle. It looks great and protects against cord stress. This page left intentionally blank so you can ponder how the Apple adapter is over 10 years old and nobody has made this before. By turning your adapter sideways, Blockhead brings its center of mass closer to the wall. This means less tension on the plug and a lot less falling out. At just over an inch thick, Blockhead is the thinnest possible way to charge your MacBook. Even the standard cord needs twice as much room. Blockhead can turn all of these adapters on their head. Well, not on their head, but close enough to the wall so they’re out of the way. It’s a kaleidoscope of compatibility. Will Blockhead fit my charger? Blockhead works on Apple chargers rated for 10 watts or higher. All MacBook computers, and all currently shipping iPads are compatible. Older iPad minis that shipped with 5 watt (iPhone style) adapters are not compatible. Will Blockhead work in my country? Blockhead is UL certified for use in the US and Canada. It will function in any socket that can accept a NEMA 1-15 plug (two parallel blades). When will you have a Blockhead for my country? We are exploring how Blockhead might work in Europe and other regions. Let us know you’re interested by joining this email list. We’ll keep you updated on progress, and should something become available, you’ll have early access. How does Blockhead attach to the Apple charger? Blockhead slides into the mechanical attachment on the corner of your Apple charger. The prongs are directed toward the side, so your Apple charger will plug in flat against the wall. 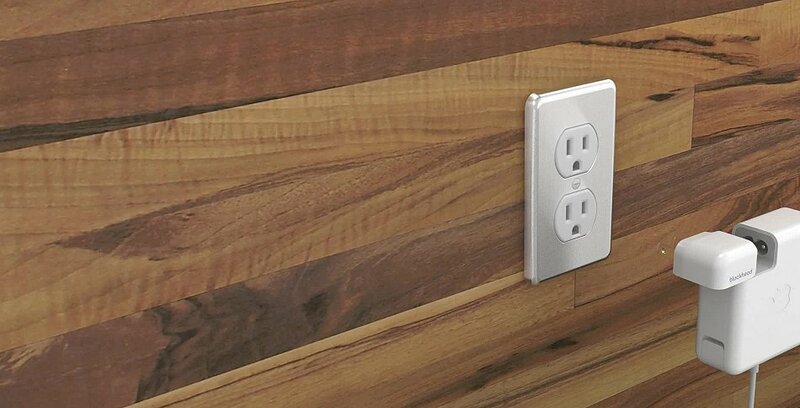 Can I fit two Blockheads side-by-side on one outlet? You bet. 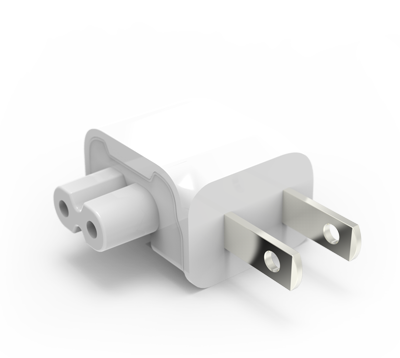 The repositioned prongs even allow two chargers to share smaller quarters, such as adjacent plugs of a standard 2-prong extension cord. This looks like it’d work with my Airport Express. Will it? If your Airport Express is shaped like a Macbook Power supply, then yes. The newest Airport Express models require an external power cord and are not compatible. Where is Blockhead being used right now? Behind our couch, of course. Oh, and that tight outlet behind the stove. There’s one in the dining room because it looks a bit cleaner than the standard plug. Almost forgot - there’s also one in the hallway attached to the old airport express. Didn’t Blockhead used to be blue? Yeah. Now it’s white. We got bored. If you don’t see an answer to your question here, let us know! Ten One Design is a design firm based in Montclair, NJ. We make remarkable tools for remote work.